Tonight, President Obama will address the nation to discuss the drawdown of US combat forces in Iraq. In February, Robert Dreyfuss reported on the specter of civil conflict and the possibility of the outbreak of a civil war—which still looms. 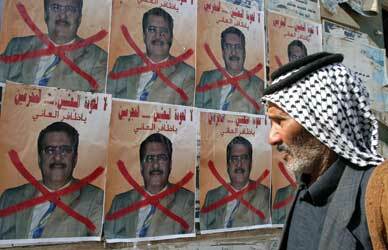 ALAA AL-MARJANI/AP An Iraqi man walks past a poster showing one of the barred Sunni candidates, Dhafir al-Ani. Editor’s Note: Tonight, President Obama will address the nation to discuss the drawdown of US combat forces in Iraq. In February, Robert Dreyfuss reported on the specter of civil conflict and the possibility of the outbreak of a civil war—which still looms. Seven years after the US invasion of Iraq toppled Saddam Hussein’s government and pulverized the Iraqi state, voters will go to the polls on March 7 in an election that most Iraqis hope will continue their country’s uneven progress toward political stability. But a new crisis, provoked by an anti-Baathist purge in mid-January by Tehran’s allies in Iraq, has threatened to unravel Iraq’s fledgling democracy. At best, a backroom deal at the last minute could restore some semblance of normalcy to the election, but the purge has poisoned the atmosphere, perhaps fatally. At worst, the crisis could reignite the sectarian conflict that brought Iraq to the brink of all-out civil war in 2006. "Do I think there could be a return to civil war?" asks Feisal al-Istrabadi, Iraq’s former UN ambassador. "I do." The possibility of new violence in Iraq, coming on the eve of the withdrawal of tens of thousands of US troops by August, has alarmed the Obama administration. At the White House, at the US military’s Central Command and at the American Embassy in Baghdad, officials are worried. "Tony Blinken was off the charts," says Brian Katulis, a senior fellow and Iraq specialist at the Center for American Progress (CAP), referring to the top aide to Vice President Joseph Biden, who has taken charge of American policy in Iraq since last summer. Another insider, who recently visited Baghdad for talks with US military and diplomatic officials and who requested anonymity, says Gen. Ray Odierno and the military command think President Obama may have to reconsider the US withdrawal timetable. "People in the administration that I talk to say Iraq is way too important for the United States to allow it to implode," he says. Just a year ago, it seemed as if Iraq was muddling through. The January 2009 provincial elections, widely seen as a dry run for this year’s more important vote to choose a new national government, boosted the fortunes of secular and nationalist parties and delivered what many analysts saw as a near knockout blow to the turbaned religious parties, especially the Iranian-backed Islamic Supreme Council of Iraq (ISCI), which lost big. Prime Minister Nuri Kamal al-Maliki, disguising his origins as a leader of the secretive Shiite Dawa Party, won strong support last year while campaigning as a born-again nationalist atop a new coalition that he called State of Law. After the provincial elections, Maliki even began to explore the possibility of an alliance with representatives of the mostly Sunni secular opposition, including Saleh al-Mutlaq, who leads the National Dialogue Front, and with nonsectarian politicians such as former Prime Minister Iyad Allawi. That was then. Starting last spring, at the urging of top officials in Iran–including Ali Larijani, the conservative, Iraqi-born speaker of the Iranian Parliament, and Brig. Gen. Qassem Suleimani, commander of the Quds Force of the Iranian Revolutionary Guard Corps–a group of sectarian Shiite religious leaders patched over their differences to establish the Iraqi National Alliance (INA), linking ISCI with the forces of rogue cleric Muqtada al-Sadr; former Prime Minister Ibrahim al-Jaafari of a renegade Dawa faction; and Ahmad Chalabi, the former darling of US neoconservatives, who has long maintained close ties to Iran’s hardliners. The creation of the INA was widely seen, inside and outside Iraq, as an Iranian project. Reidar Visser, a close observer of Iraqi affairs at the Norwegian Institute of International Affairs, says efforts to rebuild the Shiite sectarian alliance began last spring, after a visit to Baghdad by Larijani. Soon afterward, a stream of Iraqi officials made pilgrimages to Tehran, where a deal between the Hakim family (the founders of ISCI) and Sadr was brokered by Iran. "Part of the Iranian strategy has been to put politics in Iraq back on the sectarian track," says Visser. Both Iran and the new Shiite alliance pressured Maliki to join, but at that time the prime minister felt strong enough to run independently. Then, this past January 14, Iraq’s electoral overseers ratified a decision by the so-called Accountability and Justice Commission, an unelected body controlled by Chalabi and one of his cronies, Ali al-Lami, to ban more than 500 candidates for Parliament. They were barred from running, said the commission, on vague charges of ties to the deposed Baath Party. Among those banned were current members of Parliament and Iraqi officials, including Defense Minister Abdul-Kader Jassem al-Obeidi and Mutlaq, who’d joined forces with Allawi. The commission’s action was a bomb thrown into the center of Iraqi politics and sparked talk of a boycott and even a new antigovernment insurgency. Lami, the architect of the purge, has a shady past. In August 2008 he was arrested by US forces in Iraq and held for more than a year because of his involvement with a violent Shiite underground movement called the League of the Righteous. The League, which is believed to enjoy covert backing from Iran’s Quds Force, has been responsible for a series of high-profile killings and kidnappings. Recently several of the League’s other leaders, including founder Qais al-Khazali and his brother Laith, were also released from custody, and at least one of them fled to Iran. Although the Khazali brothers flirted with abandoning violence and becoming a political party, on January 23 the Khazalis’ League took responsibility for the kidnapping of an American contractor. "The country will go into severe turmoil, I’m sure," said Allawi, after the banning was confirmed by Iraq’s electoral commission. "This will put Iraq in the box of sectarianism and the route to civil war." That Iraq is once again on the brink of civil conflict is the legacy of unresolved differences that linger in the uneasy calm that has prevailed since late 2007. Among those conflicts are the simmering dispute over the borders of the semiautonomous Kurdish region in Iraq’s north; the status of Kirkuk and its oil industry, which is claimed by both the Kurds and the central government; and constitutional and legal disputes about federal versus provincial powers, including how to divvy up Iraq’s oil export revenue. But perhaps the bitterest dispute of all is a tangle of issues that involve the disenfranchised Sunni Arab minority, tensions between Sunni and Shiite leaders, and the problem of how to reintegrate those who were part of Iraq’s Baathist past. It’s the last issue that was stirred up by the Chalabi-inspired ban. The momentum of last year’s provincial elections raised the hopes of all Iraqis who looked forward to a future in which Sunnis, Shiites and Kurds would run as Iraqis, divided not along ethnic and sectarian lines but according to political differences. To capitalize on that sentiment, a number of new parties and politicians have put down roots in advance of the 2010 election. Among them are the Iraq Unity party, formed by Jawad al-Bolani, the secular Shiite minister of the interior, and Ahmad Abu Risha, whose slain brother founded the Sunni-led Awakening movement, which brought thousands of former insurgents into politics; the Ahrar (Liberal) party, founded by Iyad Jamal Aldin, a Shiite cleric who is a fierce advocate for secularism and who is strongly opposed to Iran’s influence in Iraq; and the National Unity Front, led by Aiham al-Samaraie, the former minister of electricity. All of these parties were intimidated or otherwise adversely affected by the anti-Baathist witch hunt launched by the commission. "I can’t have my future depend on something that appears in the brain of Ahmad Chalabi," says al-Samaraie. "They are trying to clean up anyone they don’t want to see in the next Parliament." But the party hit hardest by the ban was the Iraqi Nationalist Movement, a big coalition led by Allawi, Mutlaq, Vice President Tariq al-Hashemi and a group of Sunni and Shiite secularists who hoped to capitalize on voter disenchantment with the sectarianism and religious fundamentalism of ISCI, Dawa and the Sadrists. According to Istrabadi, former ambassador to the UN, private polls taken by the American and British embassies indicate that the Allawi-Mutlaq bloc might do well enough at the polls to make Allawi prime minister. "That alliance has a credible path to power," says Ali Allawi, a former Iraqi defense minister and a cousin of Iyad Allawi. "It’s well funded, and it’s based on a bedrock of Sunni support." The most credible hypothesis is that officials in Tehran and leaders of the Shiite alliance in Iraq panicked over the possibility that the Allawi-Mutlaq party might actually win. "I think Ahmad [Chalabi] and the boys started to run scared," Istrabadi says. Prime Minister Maliki, who might have played the statesman and urged a compromise, shocked Iraq’s political establishment by siding aggressively with the Iran-backed coalition. When the ban was announced, US officials moved quickly to use their influence to reverse it. Gen. David Petraeus, the Centcom commander, warned bluntly that Chalabi and Lami had "hijack[ed] the [commission] without having been confirmed as the leadership of it and being manipulated by, reportedly, the Iranian Quds force." Vice President Biden flew hurriedly to Baghdad to urge a reversal of the ban, and after his visit an Iraqi appeals court seemed to take his advice, overruling the Chalabi-Lami commission and Iraq’s election board. After the appeals court ruling, US officials congratulated themselves. "We were heartened by the decision earlier this week to reverse the deletion of the 500 names from the election lists for the upcoming election," said Secretary of State Hillary Clinton on February 5. But not so fast. Following the court’s decision, Maliki demanded that the appeals court decision be overruled. Ali al-Dabbagh, one of Maliki’s closest aides, called the lifting of the ban "illegal and not constitutional." Another of Maliki’s aides called for the expulsion of US ambassador Christopher Hill, who reportedly lobbied behind the scenes to get the ban lifted. And, in an unusual breach of diplomatic protocol, Maliki himself blasted Hill. "We will not allow American ambassador Christopher Hill to go beyond his diplomatic mission," said Maliki. He began working with leaders of his coalition, members of Parliament and the top court to ensure that the Chalabi-imposed ban remain. The Chalabi bombshell, despite the shock it engendered, wasn’t a complete surprise. Since last summer, Maliki and the Shiite alliance, the INA, have been working hard to scare Iraqis about the alleged danger of a comeback by Saddamists. Few, if any, of the opposition candidates are Saddam loyalists, and most of them who did once belong to the Baath Party, including Allawi and Mutlaq, quit or were expelled decades ago. But Maliki and the INA are trying to stampede Shiite voters, who make up more than half the Iraqi electorate, into staying away from the nonsectarian parties, even the ones led by Shiites such as Allawi, Interior Minister Bolani and Jamal Aldin. "One of the things that Chalabi and the de-Baathification committee are trying to do is to equate secularists and nationalists with Baathists," suggests Istrabadi. "Has he succeeded? We don’t know yet." At stake is the vote of what might be called the Shiite "silent majority." Nearly all Kurds will vote for the Kurdish alliance in Iraq’s north, giving the Kurdish parties about 20 percent of the seats in the 325-member Parliament. And the vast majority of Sunni voters are guaranteed to vote for one of the Sunni-led parties or for secularists like Allawi. So Maliki and the INA are competing for the Shiite vote. And Iraq analysts say there is probably a big chunk of Shiite voters–especially among the middle class, the educated elite, shopkeepers and capital-intensive farmers in the south–who aren’t happy with the religious parties and who blame Maliki for his failure to improve the economy or deliver services. Like the McCarthyite Republicans of the 1950s, who tried to tar liberals and leftists with charges of sympathy for communism, Maliki has apparently decided that scaring his base with the fear of a Baathist comeback is his best option. Until this past August, Maliki had hoped to base his re-election campaign on a carefully cultivated strongman image, trumpeting the idea that his US-trained security forces had defeated militias and terrorists. "His political strategy was to go for the Schwarzenegger image," says Charles Ries of the RAND Corporation, an ex-ambassador who served in the US Embassy in Baghdad. But a series of devastating car- and truck-bomb attacks that leveled huge portions of downtown Baghdad in August, October and January, destroying the foreign ministry, the finance ministry and other government landmarks, demolished Maliki’s credibility as a security candidate. Maliki’s problem now is that even if he manages to do well in the election–in part by taking advantage of his ability to use state funds, the media and even the Iraqi armed forces on his behalf–neither he nor the INA will be able to claim legitimacy if the vote is marred by bans, purges and a Sunni boycott. Like President Ahmadinejad in Iran and President Karzai in Afghanistan, both suffering after fraud-stained elections, a Maliki-INA-Kurdish alliance ruling Iraq again would be unstable at best. "I don’t have any doubt that if Maliki is willing to kiss and make up with the [INA] and do a devil’s deal with the Kurds, then he can form a government," says David Mack, a retired US Foreign Service officer who served twice in Iraq. "But it will be an unstable one, because it doesn’t do anything to heal the rift between the Shia religious parties and the Sunni and Shia secular groups." And if another lethal insurgency erupts, pitting Sunnis, dissidents, Baathists and even a revived Al Qaeda in Iraq against the government, countrywide violence could draw Iran, Saudi Arabia, Turkey and others into the fight. After all, Iran is not the only country backing allies in Iraqi politics; Saudi Arabia, Jordan and the Gulf states are, on a smaller scale, backing Allawi and various Sunni candidates, an Iraqi source reports. "The Saudis don’t operate directly," he says. "They operate through a route of deniability, using Lebanese businessmen, environmental charities, an assortment of princes and so on." At its core, the crisis in Iraq is also a struggle between Iran and the United States for influence in Iraq and across the oil-rich Persian Gulf. As the United States withdraws its forces, and as Iran builds up political, military and economic influence, Iraq will likely be pulled into Iran’s orbit. "It’s almost like watching gravity work," says CAP’s Brian Katulis. Barring the outbreak of civil war, the most likely outcome of a rigged election in Iraq would look very much like the coalition that governs Iraq today, but it would be even more closely aligned with Tehran. "I think we’ll see an increasingly authoritarian regime with close ties to Iran," says Visser. As the deadline for pulling US forces out of Iraq gets closer, American influence is likely to wane. The fact that Biden, Petraeus, Odierno and Hill couldn’t persuade Maliki to reverse the Chalabi-imposed ban is a sign that the United States is no longer calling the shots in Baghdad. In fact, there is rising awareness in Washington about the inevitability of Iran’s growing power in Iraq, coupled with the realization that there is little or nothing the United States can do to reverse it. Many of the Iraqi politicians opposed to the Shiite-Iranian alliance in Iraq want the United States to halt its withdrawal and throw its weight behind them, if only to checkmate Iranian influence. So far, at least, there is little sign of that. During Allawi’s last visit to Washington, well-connected friends tried to get him an appointment at the White House with Denis McDonough, one of Obama’s top advisers at the National Security Council, but the White House rebuffed Allawi. "I told them, ‘You’re dissing the man who could be Iraq’s next prime minister,’" says Kenneth Pollack, director of the Saban Center for Middle East Policy at the Brookings Institution. Obama, most recently in his State of the Union address, pledged once again that US forces in Iraq, now at 98,000, would fall to 50,000 by August, and that all American troops would leave Iraq. Among other things, the Pentagon needs those troops for its growing presence in Afghanistan. That provides an even greater incentive for a US-Iranian accord that would extend beyond the dispute over Tehran’s nuclear program to include Iraq, Afghanistan and terrorism. But the Iranians, who are expert chess players, know that their ability to make things in Iraq better–or worse–for the United States gives them important leverage over Washington. Having few moves to make, Obama has no choice but to follow through on the US commitment to get out of Iraq.